Monday was the deadline for my Fall SWAP. Um...I'm not quite done. (And I'm not quite sure how I started this post Monday and now it's suddenly Friday, but that's a different story). I did, however, make more good progress before the deadline went flying by! I made a second Puolukka bodysuit (Ottobre 6/2009, #1), this time of organic cotton baby rib knit from Fabric.com. It's delicious! I am going to have to order some in other colors to make myself undershirts for winter. It's so soft and comfy! Again, this is for Miss M to wear under dresses and with skirts this fall and winter. It'll look especially nice with the Vadelma pinafore dress that isn't quite done (and therefore not pictured here). The Dolly dress (Ottobre 6/2008 #6) is darling, albeit a wee bit too short for a "dress." But that's alright, I prefer Miss M to wear leggings in the fall and winter anyway, so no harm done. It's funny though...Miss M is 80 inches tall, so I made the size 74 width and size 86 length. Oh well, it's easy enough to lengthen it next time. It's made from Michael Miller's Birds of Norway babywale corduroy. The Jänönheinä tunic (Ottobre 4/2010, #2) and Lilac triangular scarf (Ottobre 3/2010, #40) are made of dark green Kona cotton. I'm very pleased with the fit and shape of the Jänönheinä. When I was making it, I looked at the front and back pieces and said, "This could almost fit me!" But it turned out to be just right once it was gathered to the neckline binding. It was a last minute stroke of genius (if I do say so myself) to add the lace along both sides of the button band. Doesn't it finish it off nicely? I love it when that happens! 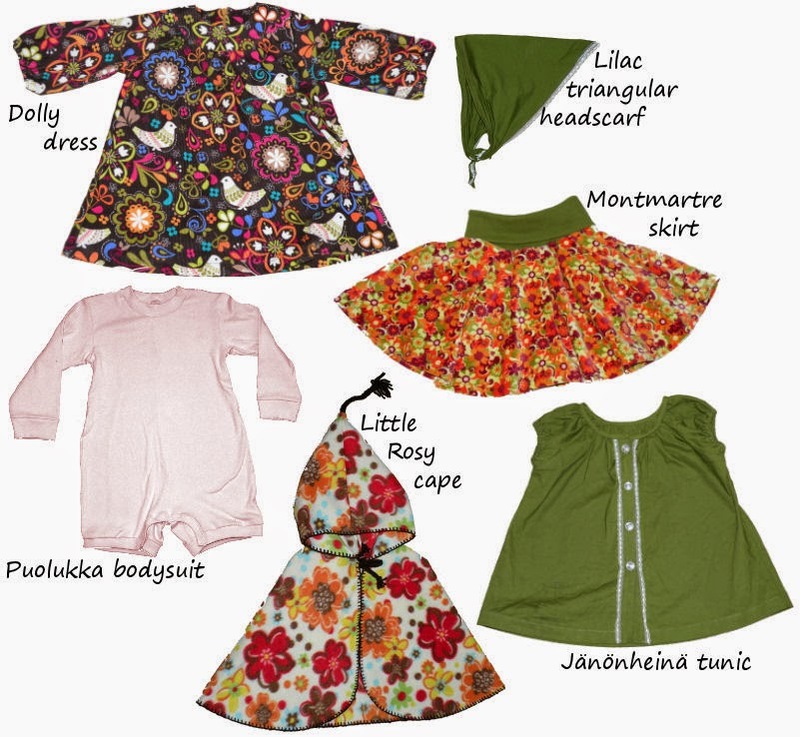 I didn't realize at first that the Montmartre skirt (Ottobre 4/2010, #25) is as full as a circle skirt. It's made of some lovely cotton velveteen by Hilco that I splurged ridiculous amounts of money on. (At least for me). But I'm glad I did. The colors are so appealing...and Miss M likes it too, which is important 'cause she's mighty particular about what she wants to wear. I've made the Little Rosy cape (Ottobre 6/2008, #22A) once before and thought it could use a little length, so I added about 4 inches at the bottom and maybe 2 to the height of the hood. I used some good ol' Red Heart yarn to blanket stitch around the front edges and fashion ties and a braided tassel on the hood. I'll have to interrupt my work on the SWAP to whip up two baby buntings for Hubby's coworkers who are having babies and then I'll get to the final two shirts and the St. Germain trenchcoat. Another great set of pieces to mix and match with. I really like the prints you chose. 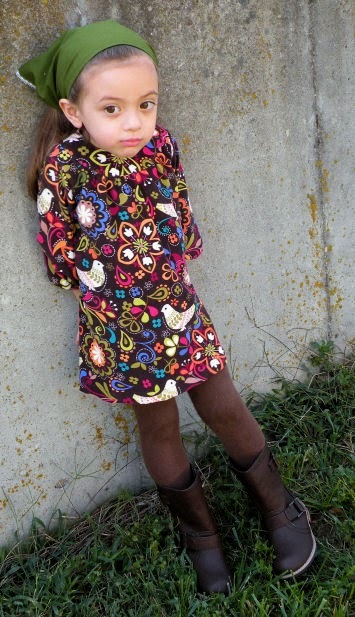 The dolly dress is adorable and looks very up-to-date with the boots on! So wonderful to be able to sew! Just gorgeous! I added your blog to the list of particpants for the Handmade Holiday at Plain and Joyful Living. The outfits are adorable! Great work.